This build has a Prodigy Turbo Charger, 2.5" lift, Assault Ful Wheels, ADD bumpers, Rigid Lights and 37" Nitto Tires. JKUR Wrangler, We did a big upgrade on the steering and brakes on this beast to get it ready for the 40" tires we installed. No matter what your looking for we can get it installed. JKU Wrangler we installed a long arm kit and and our in house fabricated ORI system for every kind of terrain. We do it all from the mild to the wild and we try and press the limits. Teraflex Lift Kit, Hard rock JK winch mount, wheels and tires. This Tacoma we just finished up has, lots of fun upgrades and more to come. 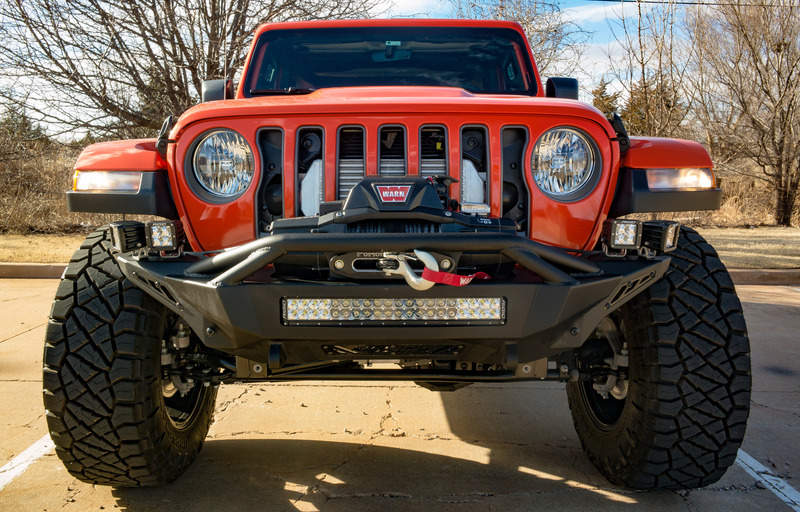 We installed the front bumper with hidden winch, Nitto Ridge Grapplers, Rock Sliders, Rigid LED lights, and a in house fully custom rear bumper. This Toyota is ready for anything. 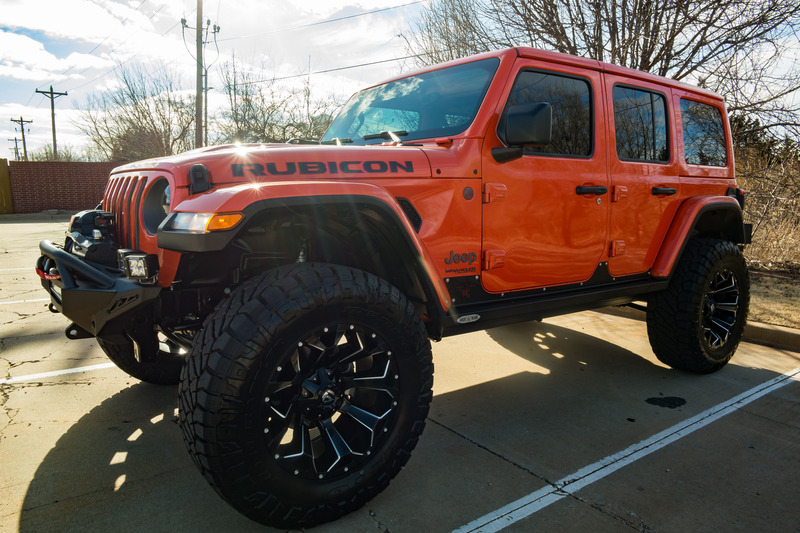 We installed a 3.5" Metal Cloak Lift, JCR front and Rear Bumpers, JCR fenders, 17" Fuel Zypher Bead Locks on 37" Nitto's. We can build the rig of your dreams. Metal Cloak 3.5" lift, HD Metal Cloak Steering and our in house Alignment. We do it all from the mild to the wild. Not all jobs are about lifts, Nitto 35" Trail Grapplers, Fuel Offroad 20" Hostages, and Rough Country trail lights for the bumper. We do it all from the mild to the wild. 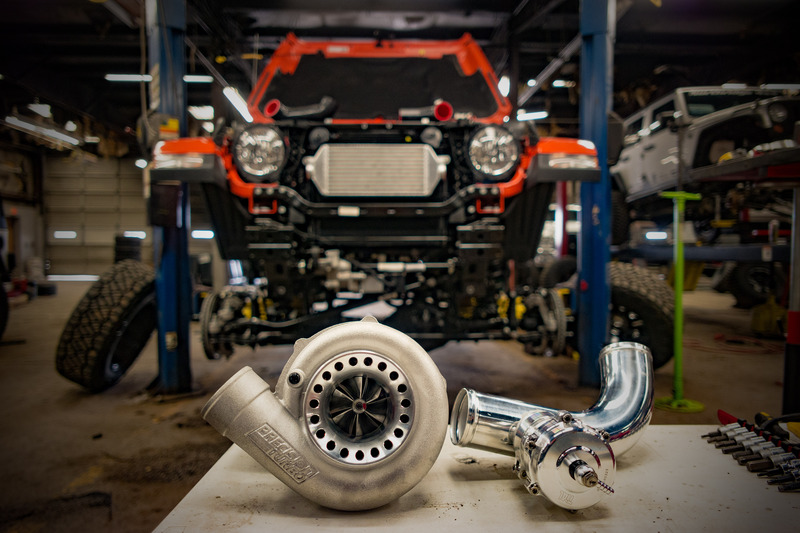 This big build on a JLUR Wrangler has all the fittings. Poison Spyder bumpers, 3.5" Metal Cloak lift with six pack shocks, Xd wheels, and 37" tires. From the mild to the wild we build them all. Lifted this 2019 Landcruiser and it looks awesome. 2.5" lift in Icon wheels and Ko2 tires. This Toyota is ready for anything. We build them from the mild to the wild. Metal Cloak 3.5" lift, 17" Fuel Assaults, Nitto 35" tires, Smittybilt bumper, 9500 winch. We build them all sizes. Another big build by our team. 6" long arm, 40" Mud Grapplers, 24x14" wheels, Fab Four bumper, Fabr four fenders and an Offroad Addiction alignment. We build them all from the mild to the wild. 3" Teraflex Lift, 35" Nitto Gridge Grapplers, 17" Fuel battle Axe, Poison Spyder Fenders with inner fenders, Amp Steps, Teraflex Tire Carrier, Alignment and a Offroad Addiction front bumper. Nissan Titan XD with Fab Four Bumpers, 2.5 Fab Tech Coil Over lift, 20" Fuel Clever wheels, 33" Nitto Ridge Grapplers and we align it in house. When you are looking for that build that will catch peoples eyes bring it to us. We build them from the Mild to the wild. This Renegade got a 2" lift and tires. It is always fun building something that is out of the norm. KFOR approached us about building this Explorer for them. We installed a 2" lift, Blue rock lights, 10 LED light bar, with a push bar, 20" wheels, 31" Ridge Grapplers, Custom center caps, and an Alignment. This Explorer is ready to chase any storm. This truck has 12" of lift, 26" wheels, and 42" Tires. This truck is built for everything. The customer wanted a smooth ride but still tow with it and it does. When you want your dream rig built and want it done right bring it to us. We build from the mild to the wild!!!!!!!!!!!!!!!!!! This 1971 Chevy K20 was a huge build from the ground up. We took it off the frame rebuilt every last inch of this beast. Every part of it is new and we installed an LS2 6.0 motor, all new suspenion custom made by Offroad Addiction. There is nothing we have not built or completed on this truck. Come and see us for your custom builds. Toyota Tacoma, we installed this beautiful front bumper, with winch, skid plates, and lighting. We love these little builds that come out perfect. This F150 looks good. Installed a 6" lift, 20" whells and 35" tires. Came out perfect. We installed one of the best lifts on the market, front rear bumpers, Rigid lighting, 22" wheels on 37" tires. This truck looks amazing. This JKU we installed assurance kits, Front and rear truss, gears, Rear tire carrier and more. We love the builds like this that when your done they look amazing. We installed front bumper, LED lights and a leveling kit on this 4runner. These SUV look like they are ready for anything with a few upgrades. This was an EPIC build from us here at Offroad Addiction. 6" to 8" full air ride suspension, bumpers, LED lights, custom paint on the grill, tailgate, and blacked out everything on the truck, 22" Amercian Force wheels with custom lug nuts (those are notplastic they are the real deal). This truck was built to use but can win any show you put it in. We build the best of the best and we make them look like show winners. Toyota 4 runner with a 3" lift, wheels and tires. This toyota came out looking perfect. Very impressed with how well this build came out. JKUR Wrangler Gobi Rack, Long Arm Lift, fenders, and the customer has plans for more on this rig, We love these big builds. The general got these awesome upgrades. 3" Teraflex Long Arm kit custom Painted Red. When you want the job done right come to Offroad Addiction. We will take care of you. Installed Winch, Bumper Hoop, Wheels, Tires, Red Rings on wheels. We do all accessories to 4x4. Customer had this Bronco sitting in Colorado rusting away and wanted it restored and driver ready. We restored the body work, painted, interior, graphixs, fixed the A.C., got it running and driving again. Added Roll cage, news 3 point seat belts, stereo, and new fixed the issues from it sitting so long. This Bronco is a beauty and drives perfectly. Installed a teraflex 3" LongArm, Nemesis fenders, annivsary hood, LED light Cowl, Nemesis inner fenders. Customer wanted his rig to drive better and look amazing. The paint came out perfect, and the drivability was outstanding. JLU Wrangler 2" Mopar Lift, 17 Fuel Wheels, and 35" Ridge Grapplers. JKUR wanted a better ride. Installed a 3" Longarm Teraflex, and 4.56 Yukon Gears. We build them from the mild to the wild. 1500 Chevy Truck with 4" Procomp Liftm, on 35" Nitto Ridge Grapplers, and 20" Fuel Assualts. Full custom build by Offroad Addiction, We designed all the suspension to perfection with Aluminum control arms, 14 ORI struts, 40" Open Country MT, 2 1/2" belly tuck, in house made truss that is bent and not cut for stronger durability, Offroad Addiction built skid plates, everything on this suspension was built by Offroad addiction. Axles are 14 bolt rear with Yukon gears and axle shafts built by Offroad Addiction, Front axle is a Superduty with Yukon gears and axle shafts, with Warn hubs. We lifted this JLU, Wheels, tires and algnment. Come to the only shop in town that does everything in house. We will make sure you are taken care of. The LS3 JKUR is a sweet build. LS3 Corvette Motor, Rock Jock front and rear 60, Trail Ready Wheels, 37" toyo tires, Teraflex Long Arm Lift paired with Falcon Shocks, and more to come. JL Wrangler with 2.5" lift on 37" tires we built. This Ford Super Duty is an EPIC build. Stryker Lift, American force wheels and toyo open country tires. You want we can do it. This Beautiful Plantinum wanted to change the look of this truck. 6" Coil Over BDS Lift, 2 Piece Fuel Wheels, and Toyo R/T Open Country. When you want a build your truck and wanting it to look show quality and drive perfect come and see us. These two builds are for a Customer and his Wife. They are show stoppers and built to go anywhere. The maroon one is custom with lots of one of a kind. Both are stellar rigs and if you want something no one else has come and see us here at Off Road Addiction. Customer wanted his Tundra look a little bigger. We installed a fab tech Coilover Kit 35" Nitto Ridge Grappler, Method Race wheels. When you want your rig looking good bring it to us and we will get you taken care of. We take care of all kinds of 4x4's. This customer did not want anything over the top so we installed the following. We do it all from full custom fabrication jobs to leveling kits. We do from the mild to the wild and love to fuel all vehicle addictions. We just got done with this suspension lift. Teraflex 3" four arm kit and an Offroad Addiction Alignment. This Subaru Crosstrek needed a little more lift. When you want your rig lifted come see us. This beautiful truck we just completed. When you are looking to have your Truck built come and see us. This Raptor cam to us looking like all the rest and he wanted to do something different. When you have a build you want done right bring it to us and we will bring it together for you. This JKUR Wrangler wanted to get something he would never have to fix. He bought it to us and we bilt the rig he wanted. When you want your 4x4 bilt right bring it to us and we will get you taken care of. 4" BDS Suspension Coil Over Suspension, Bushwacker pocket Fenders, Fuel Two Piece Nutz wheels 20", 37" Nitto Trail Grapplers, Rough Country Grill LED lights, Bak Flip bed cover, paint matched fenders and an Offroad Addiction Alignment. We build everything from small to large and when we do it we do it right. If you want to lift your truck bring it to us and we will do it right. Leveling Kit 1.5", 20" Fuel Assualt Wheels, and 35" BFG Goodrich KO2 tires. We can build any vehicle and we can build it right. Not everything has to be big. Leveling kit on 35" Nitto Ridge Grapplers and 22" fuel wheels. We build from the mild to te wild. We built this awesome truck for a customer and he loves it. 4" BDS Coilover Suspension, Fuel 20" Wheels, 35" Nitto Ridge Grapplers, and an Offroad Addiction Alignment. Come check us out for all your truck needs. We do everything for 4x4. If you want the best for your vehicle we are the shop for you. We do excellent work and take great care of our customers. This build we had to completely tear down and start from the ground up. All new paint, seats restored the dash to it's complete original look. We went through the V8 motor and got it back to running like new and updated brakes and redid all the electrical. New roll cage and all new suspension. This rig is a thing of beauty and we took a lot of pride building it. When you are ready to briong your rig back to life come and see us to fuel your addiction. We have done a lot of work to this beautiful Black JKUR Wrangler. HEre is a list of the upgrades and when you are ready for your jeep to be worked on come and see us. and we are sure there is more to come for this awesome build. This TRD Pro 2017 Tacoma just wanted more than stock so we made it happen. 6" BDS Coil Over suspension, 20" Fuel Wheels, Mickey Thompson Deagan 38 35" Tires and an Offroad Addiction alignment. Like always we take our time to make sure the product is installed correctly and a timely matter. Our goal is to get you done and a smile on your face. So come to the one stop shop that can get all your 4x4 needs taken care of. This Beautiful JK is ready for any trail after Offroad Addiction took care of them. Metal Cloak 4.5" Long Arm Lift, Synergy HD steering Kit, 39.5" Super Swamper Iroc Tires, Truss front axle, RCV front axle, and an Offroad Addiciton Alignment. Fuel the Addiction with Offroad Addiciton. 2" lift kit, 17" Hostage Fuel Wheels and 33" Ridge Grapplers. We do it all. Comeby and we can get you taken care of. This F250 Plantinum wanted to be the baddest truck on the road and I think he almost has it done. 8" Stryker Lift custom powder coated, 37" Toyo Open Country, American Force 22" wheels and an Offroad Addiction Alignment. This truck is beautiful and Dives amazingly. This jeep needed a lot of work done and we completed all of it. Teraflex LCG 3" long arm lift, Falcon 3.3 Adjustable shocks, Nemesis weld on sliders, Walker Evans 17" Wheels, 37" MIckey Thompsons, ARB Diff Covers, 4.88 Yukon Gears, Teraflex Epic Front Bumper, Poison Spyder frame cut rear Bumper with Rigid Lights, Genright Fenders and Sliders, S-Pod, Trail Dash, and an Offroad Addiction Alignment. We take great pride in what we do and want it to be correct when it is done. Silver JKUR Built by Offroad Addiction Inc. This beauty was a complete Fabrication Job.